Faculty and staff have a great impact on how prepared students are for their careers and future college experiences. Working together to bring our services to students we can increase that impact. Encourage, or even require, your students to participate in the Center for Job Placement services and activities to better prepare them for their future. Any of our workshops can be customized to be a presentation in your classroom. If you have a specific topic you would like presented we can create a package for you. Workshop topics include resume and cover letters, interview skills, career planning, job searches and other career related topics. If a presentation does not work with your class schedule please encourage students to take advantage of the workshops that we schedule during the fall and spring semesters. We host two major job and career fairs each year – Social Sciences Career Expo and the Job & Career Fair. Attending these events offer students the chance to explore career opportunities, find a job, learn to network, make connections for future internships, jobs and recommendations, practice their interview skills, and learn what skills and experience they need to develop before they can start working in their chosen career. Encourage your students to take advantage of these opportunities and attend these events, whether you have them go as a group, offer extra credit for attending or just urge them to attend on an individual basis. We also have employers who come on campus throughout the year to recruit and interview for current openings. Prior to these events we often offer other activities for students such as Mock Interviews and Dress for Success demonstrations. These events are also on our calendar. Please encourage your students to attend these activities as well so that they can be as prepared as possible for meeting employers now and in the future. 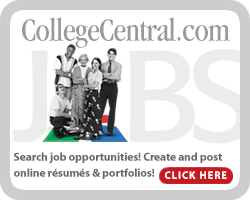 Our online job board is a consortium with 5 other CT Community Colleges, offering students the ability to search for jobs from employers that post directly to us as well as to the other 5 colleges. Whether they are looking for part time work while attending college, full time work upon graduation or finding out what skills and experience they will need before they get a job they can search our online job board, with an average of 250 to 300 open job postings at all times, to find what they need. Need blind admission is a policy in which financial need is not considered during the admission process and in most cases, once a student is admitted, the college or university will work to cover a student’s financial need either with scholarships, grants, student loans or a combination. Most colleges and universities that offer this are highly competitive and high priced institutions that our students might not consider when looking to further their education. Encourage your students to look into this program and to visit our office for help in choosing and completing applications for these schools. You are the experts in your fields. Let us know of any suggestions for workshops and presentations that we should be developing to help your students. Please share any employer contacts that you might have and encourage them to post job openings with us, attend our career fairs, recruit on campus or volunteer to work with students in activities such as our Mock Interviews. Call or stop by our office to let us know what we can do to help you and your students prepare for their future.